You will find them deep down in your wallet, in the corner of some box or in the pocket of a jacket you haven't worn in ages. I am not referring to holes in your pockets or dust. I am talking about those old coins that have lost their value as currency. 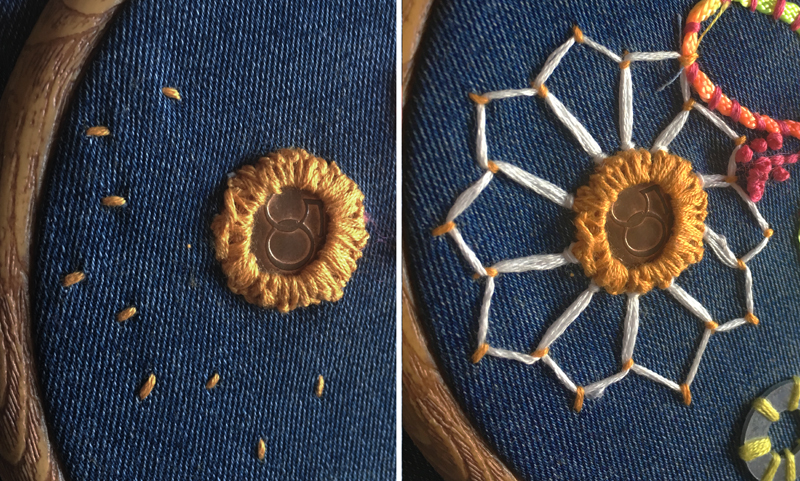 In this blogpost we are going to incorporate coins in our embroidery and make an oxeye daisy. Fabric ( I used some of the leftover denim from the fanny pack project). 1. Mount your fabric on to your loop. Place the coin where you want the center of the flower to be. Make a knot on the end of your yarn and start from the back and up through the fabric. 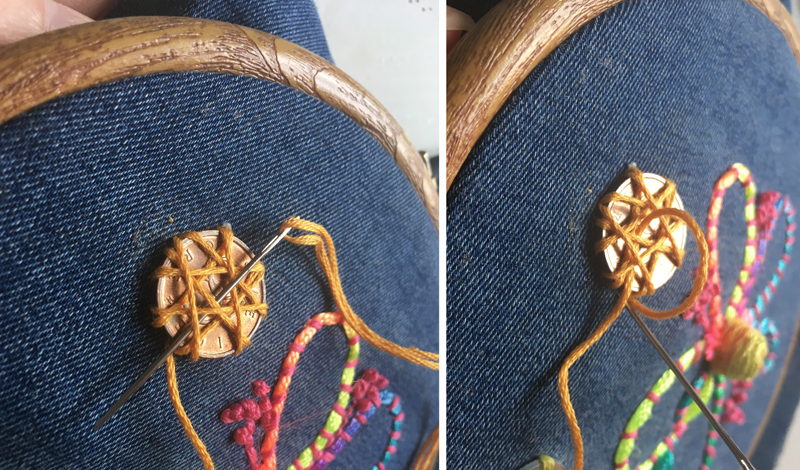 Start with making to horizontal stitches over the coin, spin the coin and do two additional stitches. Next step is to make two diagonal stitches, spin the coin and do two more. You will now have made in total eight stitches and your coin is attached to the fabric as shown in photo nr 1. 2. Bring your needle down in the center of your threads and gently pull the thread down to the side. A small loop will emerge. Pass the needle through the loop and pull slowly down to the side of the coin to make a knot. Bring your needle down the fabric and up again to attach the stitch (leaving the knot on the front side of the fabric). Repeat the stitch until you have covered the sides of your coin. 3. 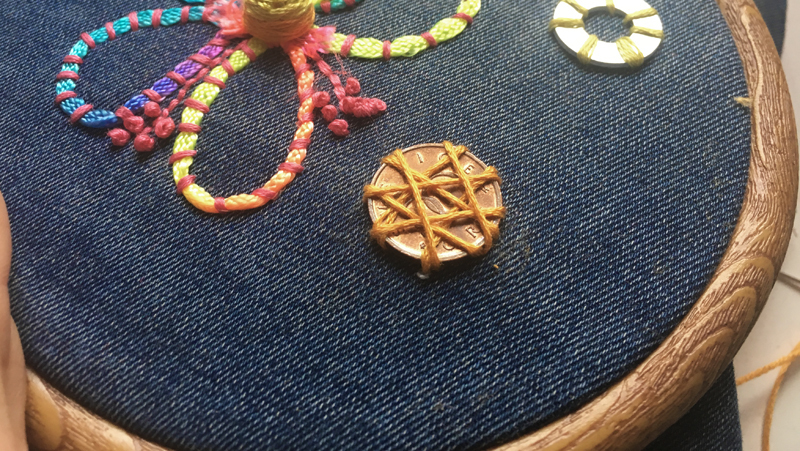 When you are closing in on your first stitch your coin will be firmly attached as on the photo above. 4. Connect the dots! 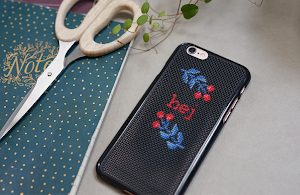 This way of stitching is both easy and gives fast result. 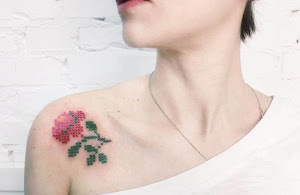 Make small stitches to outline the petals (left image). If it feels scary to stitch by freehand, I recommend the use of a fabric marker to outline the edges before you start. 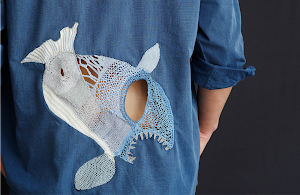 Pull the thread (from the back in to the front). Start from the side of the coin and navigate your needle and thread through your earlier small stitches. 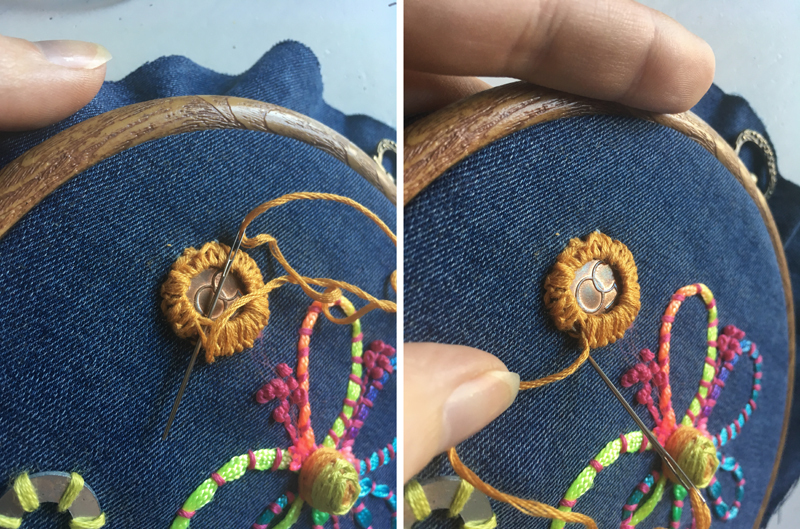 The movement starts från the coin, up to the small stitch furthest away from the centre and back down to the center. Repeat. The way of stitching reminds of how you would connect dots with a pencil. To keep the longer stitches firmly attached to the canvas, add some small stitches down the base (right image). You have now officially brought additional value to your coin (s). 5. You can use the result as it is ( as a work of art) by hanging it in a loop on the wall. 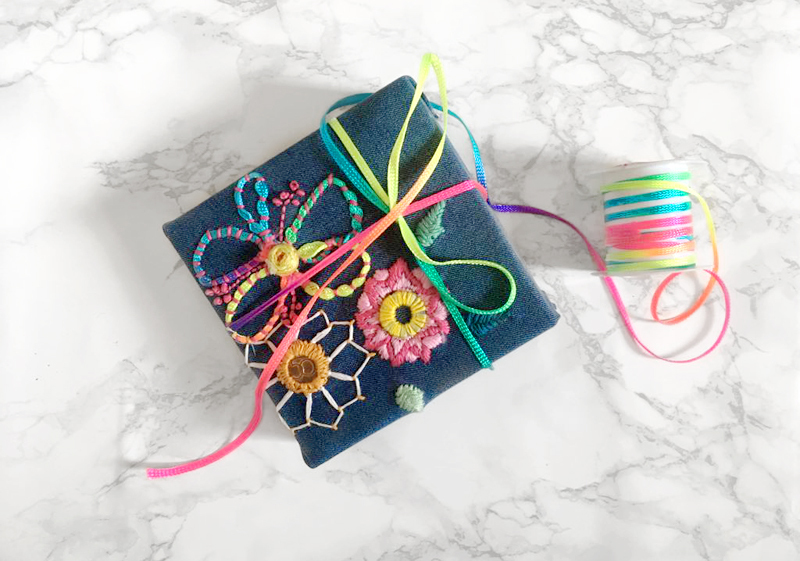 But you can also do as I have done: glue the fabric on to the lid of an old paper box to get a luxurious gift wrapping :).